For the last four months I’ve been using Stoneline cookware in place of my regular pots and pans. I’m always interested to try out non-stick cookware because I hate scrubbing pots and pans. I put the cookware through the paces. I don’t just follow the instructions, I do some of the things you're not supposed to and see how it performs. The problem with most non-stick pans is that the surface eventually peels, flakes, chips or stops being non-stick, also some of it like Teflon is made with harmful chemicals such as perfluorooctanoic acids aka PFOAs. In four months of using the Stoneline cookware (which is PFOA free) there has been no degradation of the cooking surface. The surface of the pans is smooth but looks like stone, there is nothing to peel or flake. Unlike ceramic non-stick it’s very durable and even when stacked up the pans don’t scratch or chip. They also don’t stain. Stoneline describes the cookware surface as a “reinforced stone coating” made of microscopic particles of stone that are transformed into an ultra-hard non-stick coating that won’t scratch, is extremely durable and resistant to abrasion. Stoneline cookware works with all stove tops—gas, electric, induction and ceramic. It can be heated up to 350 degrees on the stove or oven. The pans are initially seasoned with a few drops of oil, something that can be repeated, but I have not found it necessary to re-season them. The cookware has a 12 year warranty and a money back guarantee within the first 30 days if you decide you don't like it. The first thing I noticed about the cookware is how much hotter it seemed to get than other types of non-stick. I tried cooking eggs because they tend to stick. I learned quickly that I had to use much lower heat than I was used to, but even overcooking the eggs, they easily slipped out of the pan. The instructions say you don’t need to wash the pans, just wipe them with paper towels. That works fine for most things, but some liquids and sauces need to be rinsed off when reduced. That said, there is no need to use detergent or to scrub! But just to see how it would fare, I scrubbed and found the pans still did not scratch. I gave a few of the pieces of the set away and the feedback I got was consistent—that it heats well and evenly and browns food without sticking. I will keep using these pans, so far I'm very impressed with their performance. 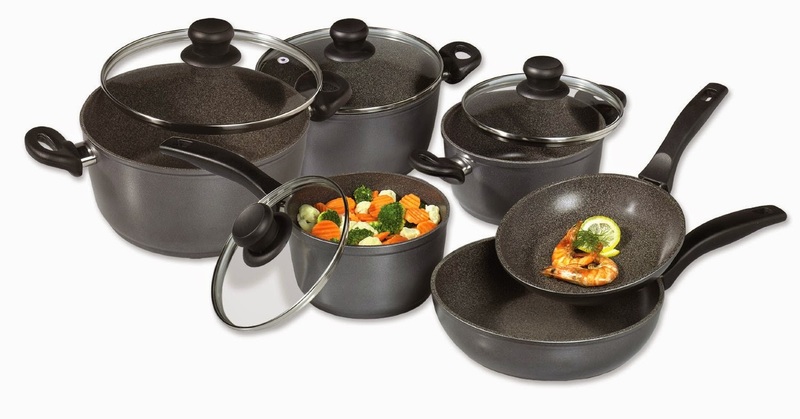 Disclaimer: My thanks to Stoneline for providing the cookware to review. I received a 13 piece set a wok and a roaster. I was not paid for this or any other post.